Woody debris (WD) is a critical but often overlooked component of forest ecosystems. WD represents a globally significant carbon stock, and its decomposition returns nutrients to the soil while providing habitat to microbes, plants and animals. Understanding what drives WD decomposition is therefore vitally important when building models of climate change and nutrient cycles. Scientists have long known that different woody plant species decompose in different ways and at different rates, and that this is at least partially due to the role of bark in decomposition. However, because previous studies have often failed to distinguish between bark and wood, scientists have been unable to determine how bark traits such as density, thickness and pH affect WD decomposition. In a recent study, researchers from Kunming Institute of Botany, Chinese Academy of Sciences (KIB/CAS) and World Agroforestry Centre (ICRAF) tackled this issue by looking at the role played by different bark traits in the decomposition of 15 woody plant species. 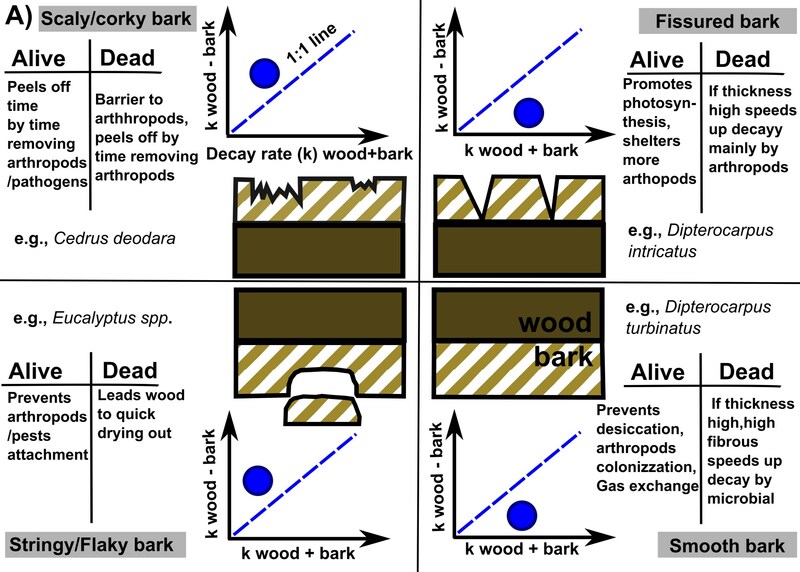 The study, entitled "The cover uncovered: bark control over wood decomposition ”, describes how interspecific variations in bark affect the decomposition of the wood inside it. The scientists found that: bark effects on WD decomposition are species- and wood size-specific; bark enhances the decomposition of coarser WD, but slows twig decomposition in some species, and in the early stages of wood decomposition, bark prevents certain animals from accelerating decomposition. The paper was the first to describe how bark characteristics such as thickness, structure and chemical content, which in life help the bark layer protect the plant and provide habitats for other organisms such as insects, also have important ‘afterlife effects’ on the decomposition of other parts of the plant. Future research could extend this analysis to other plant species, allowing scientists to better understand the role of woody debris in carbon cycling.